In April of 1950, about two dozen of the artists who came to be known as the Abstract Expressionists met for a series of discussions about their own work as well as about the modern scene. 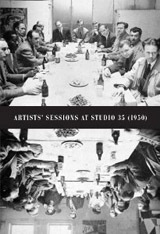 Nearly 60 years after the actual meetings took place, the transcript of “Artists Sessions at Studio 35 (1950)” still pulses with the heated discussions around basic artistic issues like titling, process, relationship to history, community, and professionalism. Often referenced, but rarely fleshed out, this series of closed meetings allows readers fly-on-the-wall access to the artists’ discussions. *This publication serves as a companion to another text documenting American modern art at its inception, Subject Matter of the Artist: Writings by Robert Goodnough, 1950-1965.